It’s time for Thirteen. 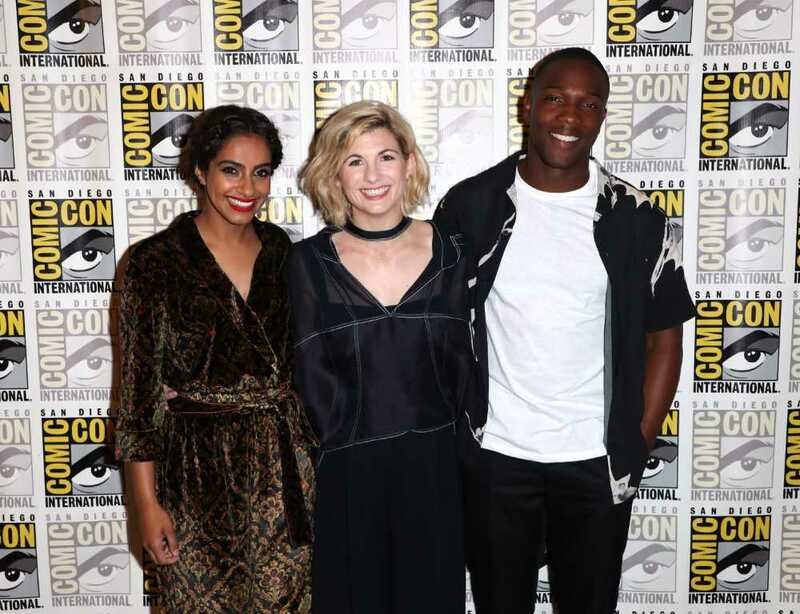 Today the thirteenth (or fourteenth, or even fifteenth depending on how you count these things) actor to play the iconic Time Lord, the Doctor, debuted at San Diego Comic-Con. New Doctor Who star Jodie Whittaker, along with castmates Tosin Cole (who plays “Ryan”) and Mandip Gill (who plays “Yasmin”), joined new showrunner and executive producer Chris Chibnall and executive producer Matt Strevens, to answer questions (well, vaguely answer– we all avoid spoilers to maintain the magic of watching together, right?) about the upcoming series, the heritage of a 50+ year old show, and having the Doctor in a female body for the first time in screen. This morning we attended the press conference prior to the Hall H panel for the new series of Doctor Who. Chibnall: It isn’t an edit, it just seems more natural. Matt Strevens: They’re the Doctor’s mates, the Doctor’s friends. Whittaker: I still call them companions. Chibnall: We’ve got all new stories all new monsters, all new villains. He expanded to point out that they’ve only got two weeks of filming left and haven’t come across any old monsters yet. When asked about the moment she felt like the Doctor, Whittaker said she was “thrown in the deep end.” But she did say that early in filming there was a “kind of important speech” and that the moment solidified her feeling of being the Doctor. Gill described her character Yasmin as “a 19 year old girl who asked for more and got more.” She described the character as being completely in awe of the Doctor, and how she got a whole new family in her friends, with whom she has a really nice relationship with. Cole described his character Ryan as “a chap.” He said Ryan goes with the flow and enjoys the ride. He’s “the most boisterous”, challenging the Doctor, and gets kind of a reputation for that. 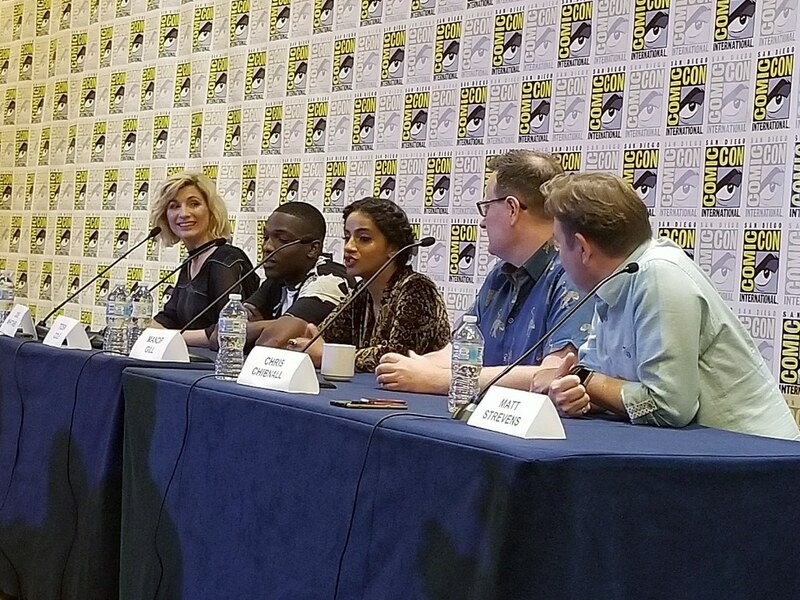 When asked how they would describe Jodie Whitaker’s Doctor, castmates used words like “witty,” “bubbly,” and showrunner Chris Chibnall called her “effervescent.” She is described as filled with childlike wonder and a joy for living and for life itself. I for one am so excited to have an actor like Jodie Whittaker in the role and can’t wait to see what’s next for my favorite Time Lord. Overall it was so much fun to see how close they already are and to watch the ease with which they spend time together, laughing and joking. Watch the trailer for the new series of Doctor Who, premiering this fall.